RESTORED ‘BEAST OF TURIN’ UNLEASHED AT LAST! 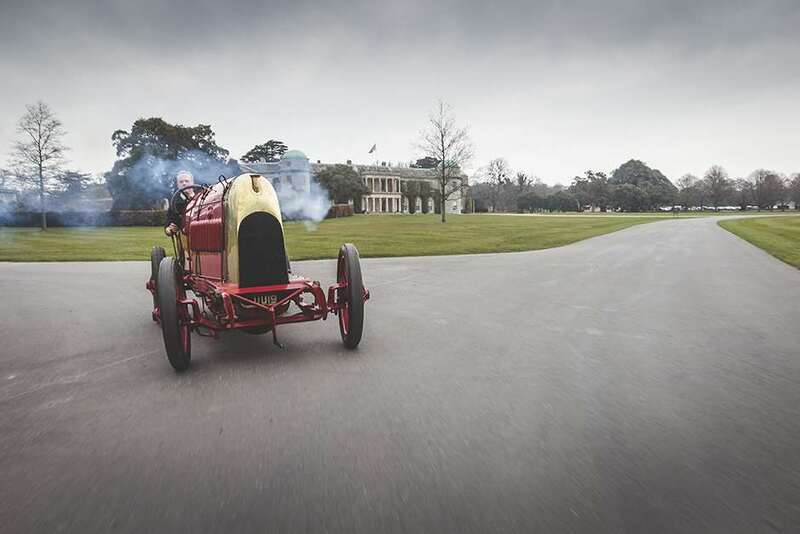 The Fiat S76, unofficially the fastest car in the world in 1911, has been driven for the first time in over 100 years – tackling the Goodwood Hillclimb during its first post-restoration test run. The feat is due to be repeated at FOS this year, when the S76 will be one of the stars of a special category of ‘earth-shattering Edwardian leviathans’. Following a 10-year restoration process, and a static appearance at the 2014 Festival of Speed when we had hoped the car might be ready to be coaxed into life, the S76 was actually fired up for the first time in a century last December – generating huge interest among car enthusiasts worldwide. With the mechanical issues that prevented the S76 firing up at FOS last year finally sorted, its enthusiastically ‘hands-on’ owner Duncan Pittaway brought the S76 back to the 1.16-mile Goodwood Hillclimb a couple of weeks ago for its first test run since the restoration, inviting Lord March along for the ride in the passenger seat. The amazing moment in automotive history was captured by filmmaker Stefan Marjoram who has been documenting the restoration. Watch the video and you’ll understand why the car was known in-period as ‘The Beast of Turin’. Just two S76s were produced by the Italian manufacturer, with the aim of snatching the records for the flying kilometre and flying mile from the ‘Blitzen’ Benzes. 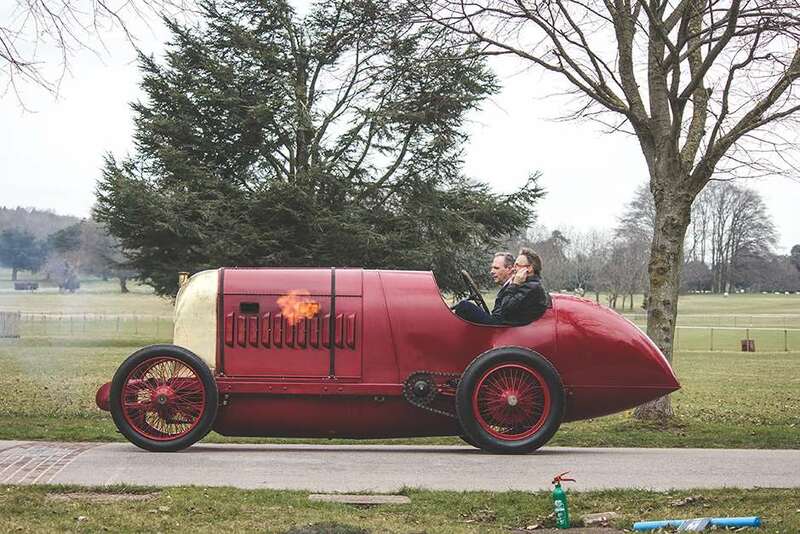 The S76 achieved the mile record with Pietro Bordino at the wheel at Saltburn Sands in 1911 and was officially recorded at over 135mph on a kilometre attempt at Oostenede in Belguim, only to be denied the record as it was unable to complete a return run within the specified one hour. While one car was dismantled by Fiat after the First World War to prevent rival manufacturers obtaining its technical secrets, the other was purchased by Russian aristocrat Boris Soukhanov and eventually made its way to Australia, where it was modernised and campaigned as a ‘Fiat Racing Special’. Enthusiast engineer Pittaway (who incidentally plans to drive the S76 to the Festival of Speed from his base near Bristol), brought the chassis back to the UK in 2003 and reunited it with the original 28.5-litre, four-cylinder engine from the dismantled car. This fabulous machine is indicative of an era in which motor racing was in its infancy and the flat-out and fearless competitors would do battle over hundreds of miles of dusty and cobbled roads with danger never far away. Among the other leviathans confirmed for the Festival of Speed are huge-engined machines from the likes of Benz, Darracq, Mercedes, Metallurgique-Maybach, Mors, Napier and Sunbeam.